Tool life affects the cost of the production significantly and it highly depends on shrink fitting conditions of die components in cold forging operations. The tensile strength of stress ring and shrink fitting rate of die insert are the most effective parameters on tool life. 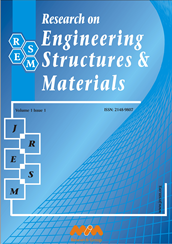 In this study, tool life of dies consisting of H13 steel stress ring were compared to dies with carbon fiber composite reinforced stress rings. Initially, two different composite dies were produced using Tenax-E IMS65 E23 24K 830tex and Tenax-J UMS40 F23 24K 800tex S carbon fibers by filament winding method. In order to determine the proper fiber orientation, numerical analysis of cold forging process was carried out on ABAQUS and SIMUFACT finite element softwares. According to numerical results, [90/±45/±15/90]n fiber orientation was chosen for industrial application. It was found that the die made of Tenax-J UMS40 F23 24K 800tex S carbon fiber composite reinforced stress ring has the highest tool life and showed 25% higher tool life compared to conventional steel dies.